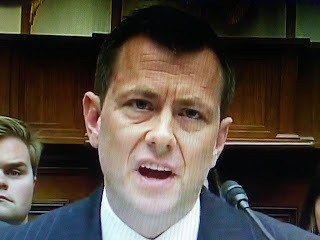 I'm amazed this piece of filth still works for the FBI. Fox News reports anti-Trump FBI agent Peter Strzok insisted on preserving his security clearance and powers he held as a deputy assistant director at the agency before joining Special Counsel Robert Mueller’s team, newly released emails show. The emails, acquired by the conservative watchdog Judicial Watch, reveal that Strzok’s supervisor agreed to make him a “floating” deputy who would be able to approve national security letters and declassify documents – all while working on the Mueller team investigating the Trump campaign’s alleged collusion with the Russian government. “Broadly, I need to be able to act at least in the capacity of my old CD [counterintelligence division] DAD [deputy assistant director] job – approve NSLs [national security letters], conduct [redacted] declassify information, [redacted] agent travel, requisitions, etc. Of those, the most problematic and one of the most essential is declassification authority,” Strzok wrote in an email to Bill Priestap, FBI counterintelligence chief, dated July 13, 2017.